MASON, W.Va. — Close, but not close enough. 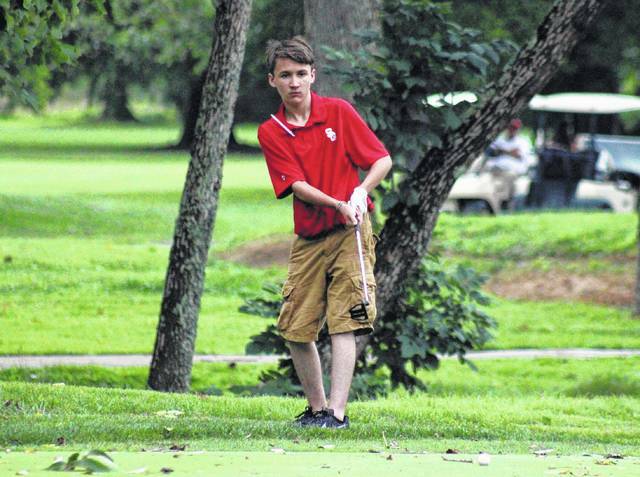 Belpre snuck away from Riverside Golf Course with a two-shot victory on Tuesday during a five-team Tri-Valley Conference Hocking Division contest in Mason County. The Golden Eagles had the fewest participants of any of the teams there, but the quartet of Jeremiah Stitt, Maddie Roby, Brittany Shaffer and Brady Shaffer combined for a winning tally of 215 — which ended up being two strokes better than host Wahama (217). South Gallia was third overall with a final total of 245, while Miller (247) and Federal Hocking (267) rounded out the top five spots. Only two golfers posted sub-50 rounds on the par 35 layout, with Miller’s Hunter Dutiel coming away with medalist honors with an 8-over par round of 43. Wahama senior Anthony Ortiz was the overall runner-up with a 13-over par round of 48. Brittany Shaffer paced BHS with a 51, followed by Roby and Stitt with respective rounds of 52 and 53. Brady Shaffer also shot a 59 for the victors. Dalton Kearns followed Ortiz with a 53, while Gage Smith and Carl Sayre completed the White Falcon tally with identical efforts of 58. Kyher Bush also shot a 58 and Jase Heckaman added a 59 for WHS. Curtis Haner led the third-place Rebels with a 50, followed by Noah Spurlock with a 63 and Layne Davis with a 65. Caleb Condee completed the SGHS scoring with a 67, while Dustin Bainter and Chloey Campbell also posted identical tallies of 69. Collin Pargeon followed Dutiel with a 65, while Logan Dishon and Ethan Spencer completed the MHS tally with respective finishes of 69 and 70. Trey Heffich did not have a final score at the event. Branden Bond paced the Lancers with a 61, followed by Shane Fredricks (67) and Jaydyn Lawson (69). Mitchell Clem completed the team total with a 70, while Wes Carpenter also fired a 70. South Gallia freshman Caleb Condee putts onto the third green at Riverside during Tuesday’s TVC Hocking match hosted by Wahama.